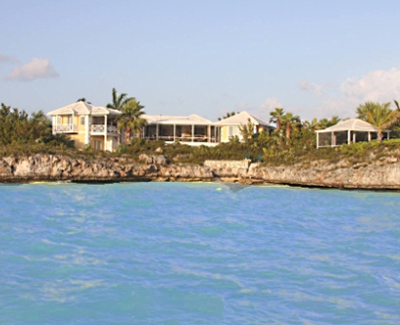 Breathtaking panoramic views of Chalk Island Sound provide the best sunrise and sunset viewing anywhere on Providenciales, and guests will experience a level of peace, serenity and privacy rarely found at any Turks and Caicos vacation rental. Our lovely South Seas Villa shines among the very finest vacation properties in the Turks and Caicos Islands. Breathtaking panoramic views of Chalk Island Sound provide the best sunrise and sunset viewing anywhere on Providenciales, and guests will experience a level of peace, serenity and privacy rarely found at any Turks and Caicos vacation rental. The South Seas Villa property spreads across four and a half acres of tropical foliage, flowering plants, and palm trees. Plants weave through the rock gardens leading down to the Caribbean waterfront. The fully screened Gazebo with comfortable seating is found at the end of a winding path that also leads down to the ocean shore, perfect for some Turks and Caicos scuba diving or some Turks and Caicos snorkeling. The waterfront includes an area of beach at low tide. Launch the included Kayak for two and head off through the turquoise waters to explore the secret lagoons of this island paradise. Take out the villa bicycles and ride down the road for some lunch and Providenciales shopping. Fine Art or Swimming Pool? The private swimming pool wraps gracefully around the curving angles of the large Villa Sun Room, perfect for a cool dip after a day of play on the white sand beaches of nearby Taylor Bay. Enjoy cocktails on the pool patio or in the breezy comfort of the screened in Sunroom with its curving panoramic views of Caribbean sunsets and dawns, and the sparkling waters of Chalk Island Sound. Tennis is included and right nearby within the Sapodilla community.